Drake in the Morning | Why Are They Called “Trailers” If They’re Shown Before the Film? by voiceover artist Eddie Deezen. Visit Eddie at his website. A great paradox, isn’t it? Those movie scenes from future films they always show before the actual film is shown are called “trailers.” But why? These earliest future glimpses were actually screened after the featured films and thus were dubbed “trailers.” Hollywood now calls these brief scenes “previews” or “previews of coming attractions.” “Trailer” is, however, still the preferred term in the industry. The early days of movies were quite a bit different from what we accustomed to today. Movies were not one film i.e. Casablanca, Grease, The Avengers or The Wizard of Oz. Early films were more like a vaudeville show. Several different, and very short, films, were shown over and over. A wide variety of films each lasting a few minutes, were shown on a continuous loop. Unlike today, where we all arrive before the start of the main film, patrons could enter the theater at any time and stay as long as they wanted. In cinema’s early days, “chasers” were actually employed by theaters. These were literally men hired to “chase” the lazy stragglers who just wanted to hang around inside the theaters and watch these same movies again and again out of the theaters. Of course, this was not only a “fair is fair” matter, but a financial decision. Getting rid of the stragglers meant more empty seats for patrons at the next film showing. A committee of the national association of motion picture industry yesterday began sending films known as trailers (advertising the bonds) to all of the 15,000 or more movie theaters in the U.S. are 70 feet in length and will be attached to longer films that will be shown at every performance. 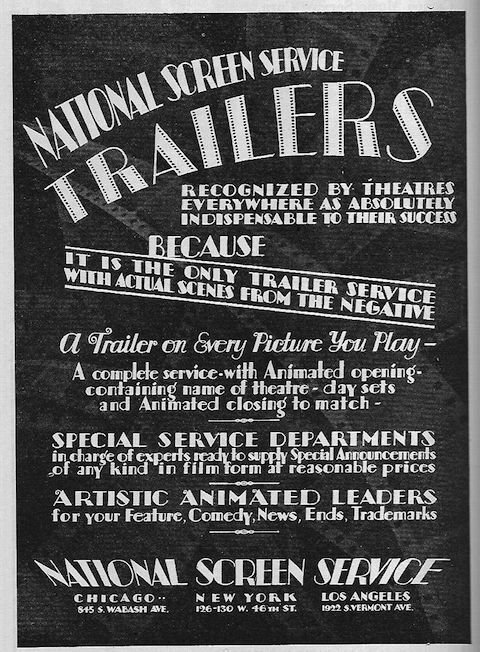 The National Screen Service, in 1919, began making crude 35mm film ads from transferred film stills (without the studios permission) and sold them to exhibitors to run following the films. By the 1930’s, movie trailers had evolved into a semi-art form of its own. Taken beyond simple newsreels and actual brief movie clips, they now often included animation, narration, and musical scores. Sometimes the trailers would include a personal plug from one of the film’s stars or even someone who didn’t even appear in the film. Also by this time, someone had the brainstorm to still include the “trailers,” but put them on before the main film, not after. Another major change has occurred in recent years. Instead of the for years usual of one or two trailers shown before the main film, in recent times, we have all grown accustomed to seeing as many as six, seven or eight trailers. (I hate them myself, I’d just rather just see the film, but most people I talk to seem to enjoy them and don’t mind.) This is a matter of the studios not only hyping their products, but giving us “our money’s worth” in time. From the 1930’s on into 1960’s and beyond, cartoons and/or newsreels were shown before a film, then maybe one trailer or two. Popeye, Mickey Mouse, and best of all, those wonderful Warner Bros. cartoons would be shown before the main attraction. Gradually over the years, the cartoons, shorts and newsreels were gradually phased out and more and more trailers were added. We get the illusion that we are being “entertained” as by a cartoon, but all we are actually seeing is a two or three minutes of future film clips.